Using a multimedia outreach strategy, illustrating a client’s goals in terms of asset preservation, and being honest in order to establish trust: these are just some of the effective strategies of experienced reverse mortgage sales professionals shared in a roundtable discussion about selling reverse mortgage products in today’s world, which took place this week at the National Reverse Mortgage Lenders Association (NRMLA) Western Regional Meeting in Huntington Beach, Calif. The discussion, moderated by Finance of America Reverse Chief Development Officer Sherry Apanay, asked the panelists and attendees of the conference about the kinds of sales strategies that they find most effective in the context of the reverse mortgage industry’s modern realities, particularly because sales can take many different forms. Conversations with consumers who have a lot of equity or a high net worth most often have a desire to preserve their assets through the use of a reverse mortgage product, said Galen Call, manager of the reverse mortgage division at TreeHouse Mortgage Group in Monterey, Calif.
Uncovering exactly what form that asset preservation may look like is important in the initial conversations with more affluent clients, and the conversation can also include pointing out the advantages of proprietary products like lower closing costs. “We’re starting those conversations to preserve equity in the home,” Call said. Call’s statements speak to the benefits of having trusted advisor relationships, Apanay pointed out. If tax issues need to be discussed, for instance, having the ability to call on a tax professional to lay out correct and relevant information in that context is key to forging a positive relationship. Sometimes clients can ask questions that would be better answered by a Department of Housing and Urban Development (HUD)-approved counselor. Even if a client insists on a loan officer’s opinion, it’s better to build further trust by laying out the necessity of independent counseling, said American Liberty Mortgage’s Reverse Mortgage Manager, Bruce Simmons. 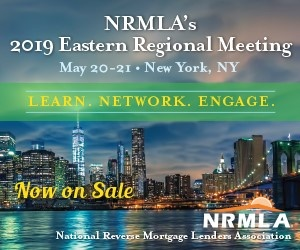 Panelists also discussed the changes in customer conversations, and what methods they find most effective in appealing to those who may be on the fence concerning their entrance into a reverse mortgage transaction. Others take a more self-described “elementary” approach. Adding the option for a face-to-face meeting also helps to further establish trust, Perry added. Both Galen Call and Bruce Simmons said that nearly 100 percent of their business is conducted via face-to-face interactions. Susan Perry related that her face-to-face business is about half, while the majority of Michael Zwerling’s business is conducted over the phone, he said. The added option of getting to meet face-to-face helps to further establish trust, and stand out from the faceless names a potential borrower could come across when trying to settle on someone to help them, Perry shared. “I give them the option to meet in person, and at that point they feel warm and comfortable and that I’m a person who has their best interest at heart,” she said.